Home > Shop > Natural black red onyx stone smoking pipe. Natural black red onyx stone smoking pipe. New handmade Natural is 3" long. half black half red color mix onyx stone smoking weed pipe with free smoking pipes screens and free shipping within the US. Good way to feel the power of nature right when you smoking your new handmade onyx stone pipe. made with care and love for the happy stone pipe smokers here and around the globe. 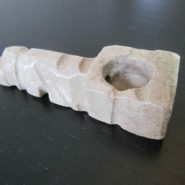 great way to connect yourself to nature with this organic stone pipes.